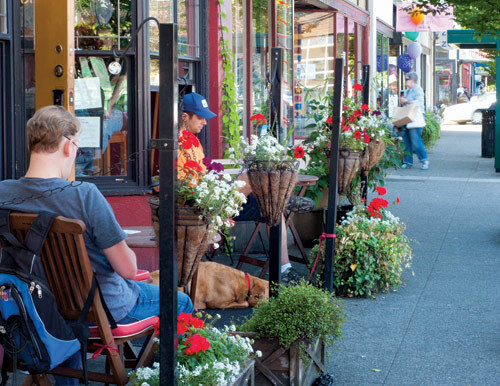 With more backyards than bistros, Phinney Ridge tends to attract more dog walkers than foodies. But what started as a trickle of new restaurants has turned into a full-on food avalanche on this hilltop nabe nestled between Woodland Park Zoo and Greenwood, bringing with it a hearty selection of new shops and boutiques. SPECIAL TO THIS ARTICLE: Take our Google map tour, accessible from most mobile devices. 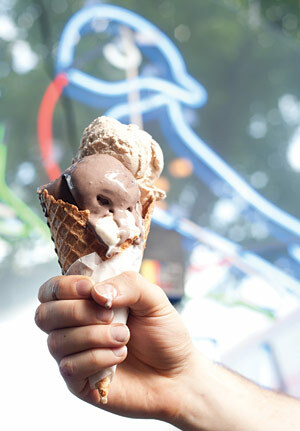 >> The bustling corner of 74th and Greenwood just got a little cooler: Located across from Herkimer Coffee (7320 Greenwood Ave. N; 206.784.0202; herkimercoffee.com) is Bluebird Ice Cream’s newest “microcreamery” (7400 Greenwood Ave. N; bluebirdseattle.blogspot.com), which will sate your palate with both ice cream and new in-house microbrews. >> If you need some savory to go with your sweet, head next door via the shared outdoor patio to Cornuto Pizzeria (7404 Greenwood Ave.; no phone at press time) for a slice of fresh, thin-crust wood-fired pizza. >> Grab a hand-pulled espresso at renowned Caffé Vita (7402 Greenwood Ave. N; 206.588.1519; caffevita.com) or down a pint at PROST! (7311 Greenwood Ave. N; 206.706.5430; prosttavern.net). The bar’s owner Chris Navarra also has a new neighborhood-centric bar and pizza palace, The Ridge (7217 Greenwood Ave. N; no phone at press time), complete with game room. >> Though several blocks south, be sure to head to Chris Porter’s first brick-and-mortar A La Mode Pies (5821 Phinney Ave. N; 206.383.3796; alamodeseattle.com), where straight-from-the-oven slices are topped with Bluebird ice cream, closing the circle of Phinney’s wonderful new culinary delights. 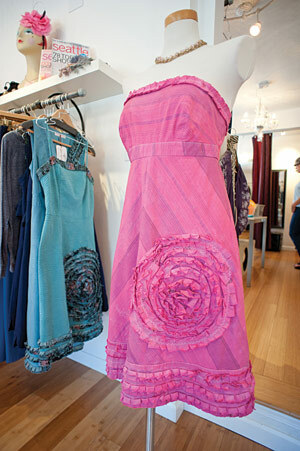 >> Classic dresses and vintage accessories continue to work their magic at Suzy Fairchild’s Frock Shop (6500 Phinney Ave. N; 206.297.1638; shopfrockshop.com). >> Across the street, Dana Smith’s HIP Zephyr (6421 Phinney Ave. N; 206.905.6069; hipzephyr.com) is all about customer service, featuring private wardrobe consultation and in-house dress parties. >> Next door, take a culinary tour of wine, cheese, olives and specialty items from nearly every western European country in Nikos Spiliopoulos and Alexis Saloutos’ pint-size The Shop Agora (6417-A Phinney Ave. N; 206.782.5551; theshopagora.com). >> No need to tread lightly at Sadaf Hussain’s aptly named Chocolate Shoe Box, where the odd yet awesome combination of fair-trade footwear and vegan chocolates inspires guilt-free sprees (7410 Greenwood Ave. N; 206.659.0062; thechocolateshoebox.com). >> Back in the 74th corridor, create, admire and shop at Assemble Gallery & Studio (7406 Greenwood Ave. N; 206.913.2470; assembleshop.com), where a fine-art gallery, weekly craft instruction and handmade gifts unite and inspire. Embrace the season’s hearty produce in a new way with Eminence’s amazing yam and pumpkin enzyme peel at Mari Mamikunian’s Luscious Skin Spa (6419 Phinney Ave. N; 206.706.4977; lusciousskinspa.com).